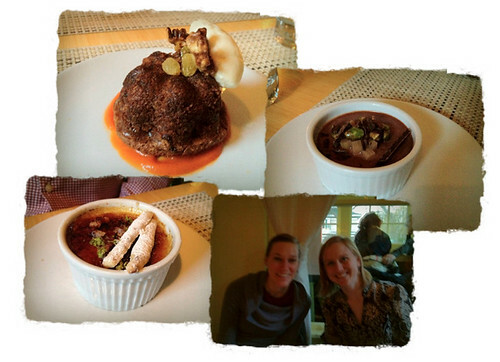 The three of us enjoyed a lovely dinner last night at Tilth as part of Seattle's Restaurant Week. I believe other cities have similar events, but mainly restaurants join together to offer 3-course menus to diners for a flat $28/person. For some restaurants, this is a great deal for the diner. You get to try out a new restaurant at a lower then normal price. To make it work for the restaurant, it's Monday through Thursday only; no weekends. But that didn't stop us! This was the perfect opportunity to test out a restaurant that I've been wanting to try since I arrived here in Seattle. Their menu is seasonal and always looks delicious. And for all your Bravo Top Chef buffs, Maria Hines, the chef, was on Top Chef Masters. To be honest, I was totally going to document the whole experience for you. But I was late at work and had to rush to make our reservation. In doing so, I forgot my camera. Then, I was so caught up in conversation (and food), that I forgot to use my iPhone. Finally, at dessert, I remembered and whipped up the above photos. Sorry the one of Beth and me didn't turn out (blame Josh - he'll blame the lighting and the window). After eating our meal, I would definitely return to Tilth, even it if meant for the regular menu (maybe just for special occasions though). Restaurant week makes for a fun night out during the week and a delicious foodie experience.